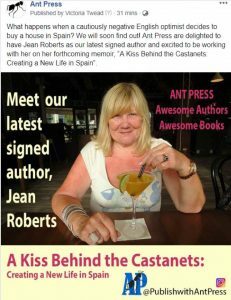 Hello - it's me :) | Jean Roberts, author of "A Kiss Behind the Castanets"
Click here or on the title to view comments or leave a reply at the bottom of this post. This is my first attempt at blogging. I’m very new to this so please be patient with me for any mistakes, mishaps, or general ditziness. Let me tell you a little about myself. I am married to Adrian, have 2 daughters (with spouses), and 3 grandchildren who fill my life with love and laughter. Somewhere along the line we made the crazy decision to buy a wreck of a house in Andalucia and so now we flit between our permanent home in the UK and our happy place amongst the olive groves of Southern Spain. I am in love with both places. Spain, the country, her people, the culture, art, food, and wine hold on tight to a huge chunk of my heart. I absolutely adore Spain. Other things I like? Well, I love travel, cats, foxes, Christmas, snug winter evenings by a roaring fire, and family time. Adrian will tell you that above all I like swearing at the computer when I get things wrong (which I frequently do.) That’s me in a nutshell. Oh, and I write. This has been an exciting week. On Monday we had a few friends over and it turned into an impromptu party. Isn’t it amazing how spur of the moment things turn out to be the most fun? We had a great time, and then on Wednesday I was offered a formal contract to publish my first 2 books. Excitement doesn’t begin to cover it. We’ve not had time to sit and reflect properly on what it all means as we’ve been busy with builders all week. We now have hot running water in the caseta, a toilet that functions without our feet needing to be in the shower, and a monstrous structure on our roof! It’s all good. I will be blogging about our life here in Spain, our travels, food, lifestyle, and sharing adventures as they happen. I hope that some of our travels may inspire others to make similar journeys. Life should be fun, don’t take it too seriously. Thanks for dropping by, please call in again soon. Thank you Sue, book 1 is with the editor now and is due out approx March 2019. Exciting times!